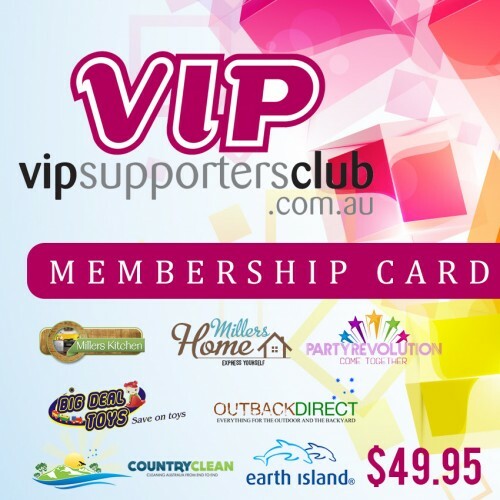 VIPSupportersClub.com.au is our member’s hub for our suite of dedicated lifestyle sites VIPSupportersClub.com.au is our member’s hub for our suite of dedicated lifestyle sites. → The recommended retail Price RRP which is what you would usually pay in the shops. → The regular price which is our everyday low price we offer to customers. → ​And then an even lower Members Price which … you guessed it is the exclusive price we offer to VIP Supporters Club members. To become a member simply purchase the membership card through this website or any of our other 7 sites and your account will automatically change to VIP Member Status and any future purchases will be at the best member’s prices. We do from time to time have promotions where you can win yourself a membership so make sure you like us on Facebook and Twitter to see if you can bag yourself a freebie. 2. Save Everyday - Login to the website whenever you need a good deal! You’ll have 24x7 access to VIP prices, no waiting. Buy anytime and save. 3. Grab Amazing Specials of the Week - Keep your eyes peeled for weekly emails (or watch Facebook) announcing the Special of the Week! Buy the special and enjoy the savings! You’re a VIP… Be Treated Like One! As a member you will also earn reward points on all purchases, these points can then be used for the payment or part payment of future orders. When you click on a product you will see the number of points you can earn when you purchase it, and then how many point you will need to buy it. To see how many point you have accumulated simply login to your account and click on the rewards tab.